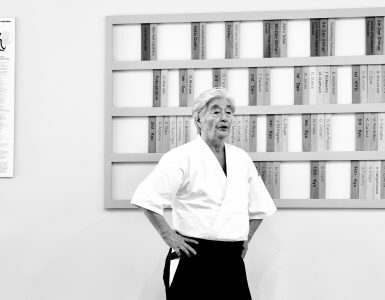 The following is a two-part interview of Shoji Nishio Sensei, a well-known 8th dan sensei instructing in the Tokyo area. The interview was held on May 22, 1983 in Tokyo. 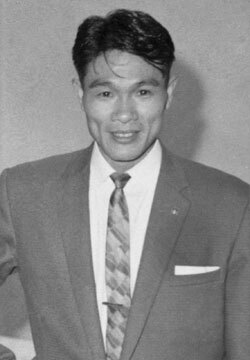 The following is part one of a two-part interview of Shoji Nishio Sensei by Aiki News Editor Stanley Pranin. Part two is here. The interview was conducted on May 22, 1983 in Tokyo. We understand that you first practiced Judo and Karate. 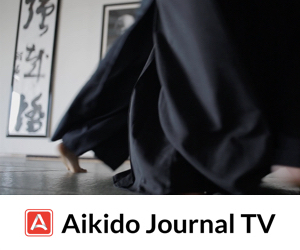 What made you begin to train in Aikido? When I first came to Tokyo, I was rather frail. I didn’t do anything. In 1942, after the war broke out, I used to go to the city Judo dojo. I was working for a public office then. In 1944, after the air raids, I started working the night shift so I was unable to continue my training. The war ended on August 15, 1945 and I went to the Kodokan on the 1st of September of the same year. There wasn’t anybody. There wasn’t even any glass in the windows. It must have been melted by the heat during the air raids. There was only half the number of tatami. The only person there was the old caretaker. There were no application forms. I just used plain paper and left it there. Then, I was contacted by the Kodokan and received a certificate of approval to begin training. I was eighteen. I was the first person to enter the Kodokan after the war. (Laughter) Anyway, there wasn’t anybody. There were no lights so it was not possible to train in the evening when it became dark. There was a time when I went there and practiced ukemi by myself and then went home. That’s how it was. About that time, the demobilization started. A lot of people appeared at the Kodokan. The following year it became very active. I was promoted to 3rd dan and 4th dan. I began to notice that there were restrictions in techniques because of competition. Because of that problem, I felt the limitations of Judo and started Karate. 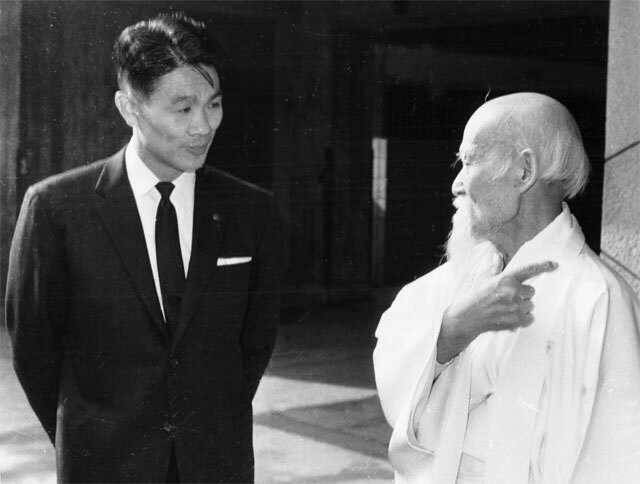 My teacher was Konishi Sensei of Jinen-ryu who had practiced Karate longer than anyone else at that time. I was practicing Karate with Konishi Sensei but I also felt the limitation of Karate. I thought there must be something else. “I met someone who is like a ‘phantom’. I couldn’t strike him even once.” I was amazed that there was someone that even Sodeyama Sensei couldn’t strike. It was O-Sensei. Mr. Nakajima didn’t join up, however, saying he wanted to do a little more Karate. After one year, he came to practice Aikido. He practiced Karate and became a 6th dan. He continued Aikido until receiving his 2nd dan. He told me that his viewpoint on Karate as a budo had changed. I thought that if I used this kokyu I might be able to go back to Judo, however. I was really amazed and I learned the depth of Aikido. To tell the truth, when I was practicing Judo, Mifune Sensei’s house was robbed twice in his absence. Those incidents were written up in a monthly magazine entitled “Judo” published by the Kodokan. Mifune Sensei was quoted as saying, “The next time he robs my house in my presence, I will catch him no matter what happens, even if I am killed!” An old man, nearly seventy was saying he would catch him even if he was killed… I was really impressed by Mifune Sensei’s reaction at that time. However, there was a big difference between O-Sensei’s and Mifune Sensei’s words. One was saying he would catch him even if he was killed and take him to the police. The other was saying that the thief took it because he wanted it and that he should be let to have it, that it was the person who was robbed that was at fault. There was a world of difference between the two spirits. I thought that even though one practiced Judo all of his life, he could only reach this staqe. On the other hand, I thought that the depth of Aikido as budo was great. It was that incident which caused me to stop my Judo training. O-Sensei’s way of thinking appeared in practice itself. He said, “It’s wrong to use the words ‘winning and losing’. You shouldn’t think in those terms.” His words were great. As we continue to live I think it’s important to digest all of his words. 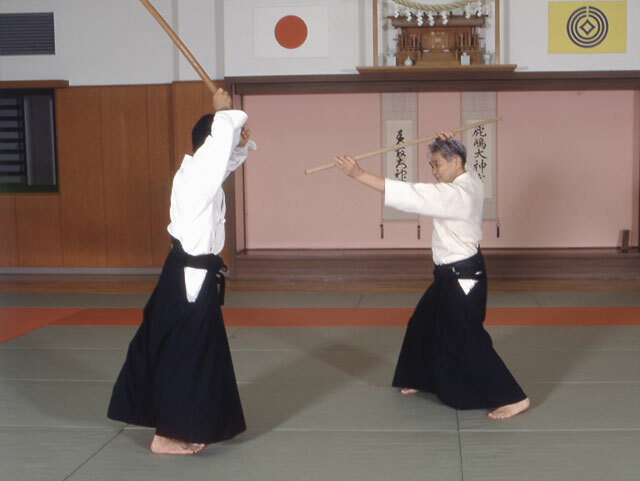 They say that O-Sensei practiced the sword and staff, but he did so in the process of giving birth to modern Aikido. Even though we imitate him we will not be able to go beyond what he did. 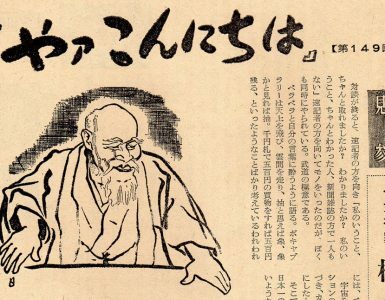 O-Sensei used to tell us, “This old man reached this stage, you should surpass me building on what I have left.” However, we tend to imitate what he did and end up going backward. 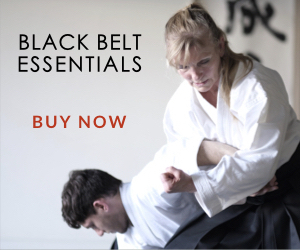 Ten years from now, we may be practicing the level of Aikido of O-Sensei as it was a number of years ago. After fifteen years, we may end up going back to the forms he practiced at an even earlier date. This is not right, he told us over and over again to go beyond what he did. People like us didn’t understand what he meant. But after several years, when we ran into some obstacle, we would think to ourselves, “Oh, that’s what he used to talk about.” Our activities depend on O-Sensei’s words. 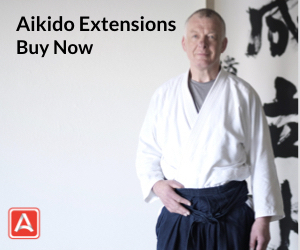 When you began practicing Aikido was O-Sensei living in Tokyo? One day, when a guest came it happened that he explained the drawing and I was told to give it to him. But when I looked at the present Doshu he made a negative gesture. I think it was because once O-Sensei began talking about the drawing the conversation would be long and would be an imposition on the guest since he wouldn’t understand it. I was in hot water. One of them told me to bring it and the other, the opposite… Also, I myself had drawn it. O-Sensei asked, “What’s the matter?” So, there was nothing for me to do but give it to him. If that drawing was put somewhere, it would always disappear! (Laughter) Then, he would say, “Oh! It’s gone!” and have someone redraw it. One week before O-Sensei entered the hospital, we posed for pictures with him. I said to him, “Sensei, let’s take a picture.” He told me to bring him his “montsuki” (kimono bearing family crest). He said, “My photo will remain. What I’m wearing is not appropriate.” I went to the present Doshu’s wife and asked for the montsuki explaining that we were going to take a picture of O-Sensei. Well, she sure complained a lot. (Laughter). It was very troublesome to have to dress him up in his montsuki. Anyway, we finally got him dressed. There was a sign which read “Aikido School” and I think he wanted a picture to be taken in front of the sign. He stroked the sign affectionately. We took the pictures there. That was in February 1969. One week after that he entered the hospital. That was the last picture. O-Sensei passed away on the 26th of April. I had a call in the morning and I drove fast to his bedside. I was the first one to arrive. Then Mr. Okumura, Mr. Yamaguchi and Mr. Tada came. His face was really beautiful like a Noh mask of an old man. If one dies of cancer, there is usually a lot of suffering and the pain remains on the face. But, that wasn’t the case with O-Sensei. He had a divinely beautiful face. When you entered the dojo, there weren’t many students, were there? No, there were only a total of seven or eight. Some days no one was there and I swung the sword by myself and went home. The present Doshu and Mr. Tohei were the teachers. Everybody was at about the same level. There were about two families who didn’t have anywhere to go because of the damage caused by the war. In the evening, the smell of burned mackerel permeated the dojo. The partitions dividing the dojo did not run all the way to the roof, so the smoke entered into our side. We practiced surrounded by the odor of mackerel and cooked food. We were lucky to have four or five people attending a class. My partner was Mr. Tada. There are now two people that I can talk to. They are Yamaguchi Sensei and Saito Sensei. Their forms are completely different, but it’s good study for me. They both have something I don’t have. Technically, Yamaguchi uses the ken and although Saito Sensei uses the ken too, you could almost say their approaches are opposite. 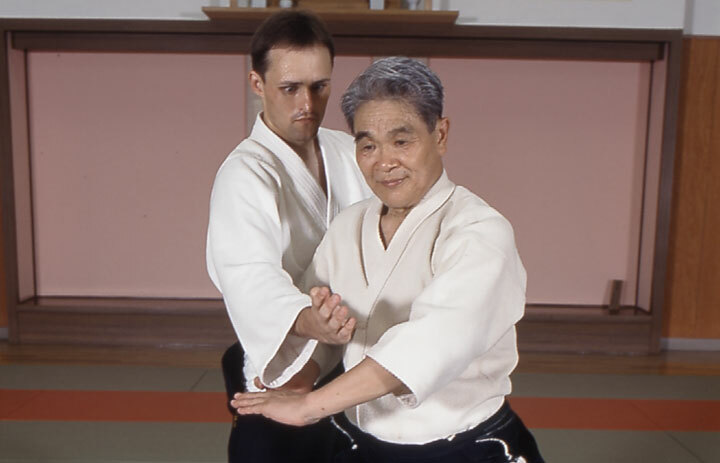 Saito Sensei is the only person who can hand down O-Sensei’s Aikido exactly as it was. I’ll say clearly that my way is different. My view of Aikido is different. In November of this year (1983), I will have worked for the mint of the Finance Ministry for 39 years. We are technicians. Technicians are people who make people’s dreams come true. If they can’t achieve this they are worthless as technicians. Technicians concretize people’s dreams and make them a reality in society. Aikido is the same. By meeting people’s wishes we contribute to society. That’s what Aikido should be. Takemusu Aiki which creates and which nurtures all things was first created by O-Sensei. It is from this standpoint that I approach budo. My way is different from people like Saito Sensei. Saito Sensei is the only person who can hand down the past. This is what we have to do to forge the future. If there are ten of us, we have to join forces to realize O-Sensei’s Aikido. It is the role of Saito Sensei to hand down O-Sensei’s art exactly as it was. When we get confused about something, we can go and learn from him. He is able to do that for us. Our task is to respond to new wishes and fulfill them. I think that we have to express O-Sensei’s philosophy by awakening to our own worth and utilizing our strong points and join forces. An isolated individual doesn’t amount to much by himself but with three or four people like Saito Sensei and Yamaguchi Sensei united together we can create wonderful things. The ways of Yamaguchi and Saito Sensei are included in our thinking. What I am accomplishing could not be done alone but only by building on of the ideas of my sempai (seniors). I value them greatly. I have never said to anyone, “You are wrong.” I have never told anyone to do something otherwise because their way was wrong. Everyone has his own reasons for doing something in a certain way. Mr. Ito: I don’t think that people who fight in the Aikido world have any right to impart O-Sensei’s philosophy. I don’t understand how people who are practicing a budo whose purpose is to eliminate violence can fight with each other. That’s what I always say. People abroad are fighting, aren’t they? That’s why I went to Europe last year. Because two of my deshi were fighting each other I went there to stop them. I don’t understand why they can’t get along. If your deshi fight with others, your way of teaching is bad. That’s what some people say. (Laughter) Anyway, I went there to find out why they couldn’t join together. At least, they shouldn’t speak ill of each other. This is a minimum requirement. If possible, they might hold a seminar together. In this way they could accomplish bigger things. This is what I told them. The situation in America is the same. For example, the problem concerning Mr. Saotome. It’s childish to prevent him from entering the United States Aikido Federation because they don’t like him. People who say things only with emotion don’t have a right to be instructors. I want to make this clear. I am not a member of the inner group… So I’m thinking of talking to Saito Sensei when he returns to Japan. He is in a more powerful position to express his viewpoint. I have been thinking to ask him to state his views as I intend to do the same. Otherwise, the situation in America will never improve. Yoshinkan has been quite active recently. I hear they have begun establishing branches in Canada. Mr. Shioda is sempai to me so I let his students practice with us. I allow students to practice with us even if they are members of the Tomiki group or the Yoshinkan. I don’t understand why people who practice Aikido fight. I think that what they say is different from what they do. If we have bad points, we should help each other to correct them. We have to grow helping each other in this manner. However, we try to find each other’s faults and make the wound deeper becoming separated. This is strange, isn’t it? What they say is completely different from what they do. I’m really worried about this situation. If you compare Aikido to Judo or Kendo we are lucky because we have second and third generation leaders (Doshu and his son, Moriteru). There is no second generation in the case of Judo, Kendo or Karate. Compared to those arts we should consider ourselves fortunate. To make Aikido bigger I think we should go back to the fundamentals of the art. We should get together. It is a time when we need Saito Sensei’s power. And also Yamaguchi Sensei’s unconventional way of thinking. I believe that if those two sensei joined together that would be wonderful. In a way, I am playing the role of intermediary between the two. They hardly talk to each other. I wish that they would begin to communicate. I always say that if a teacher of Aikido takes up the ken, he can re-apply his knowledge to the ken. And the same is the case for the jo. (When I was a beginner) I asked how they applied the body techniques to the ken, but no one showed me. Since there was nothing to be done about the situation, I began practicing the ken in 1955 soon after I began Aikido training. What else could I do? Nobody taught me! 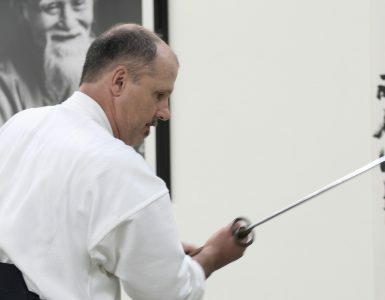 O-Sensei did sword techniques at lightning speed and would say, “That’s how you do it,” and then disappeared from the dojo. I tried in vain to understand what he was doing and the next moment he was gone. (Laughter) When I was asked, “Do you understand?” I would answer, “Yes,” but I really didn’t understand at all. (Laughter) When I asked other senseis to explain how he did it they would merely reply, “That’s how he did it.” They didn’t show me anything. So I thought there was nothing else I could do but study by myself. Then I thought I should start at the beginning if I was to do it. After I began studying the ken I started to appreciate how to handle it properly. 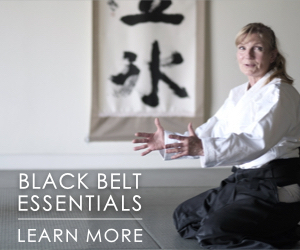 When I combined it with the Aikido way of thinking I began to understand many things. So I understood how what O-Sensei was saying made sense. This is our way of thinking. One step before the throw, victory and defeat are decided. You have the feeling of saying, “Do you understand? Now go!”, and you release the attacker. The throw is as if you were saying, “Do you understand? Good luck!” and send him on his way. If you throw the attacker trying not to injure him, he won’t hit his head. It is that very concern that is the most important aspect of humanity. It’s wrong to beat the person up you have just thrown after he has already given up. That kind of person is not a human being. People who know how to throw properly would hold the attacker’s head and throw him gently so he doesn’t hit his head. Without that sort of mental composure, you shouldn’t throw. Where is part 2 of this interview?